Just before the new year, we had a chance to head south (okay, only about 40 minutes) and eat at the Chowder House Cafe, located in Cuyahoga Falls. We arrived right as they were opening for the evening, so we just about had the place to ourselves for a while. A wide variety of artsy stuff on the walls make for a neat dining environment. It was a little on the cool side (and she even specifically sat us away from the windows), but not uncomfortably so. Such is life in December. Due to the name of the place, we felt obliged to start with a cup of the clam chowder. 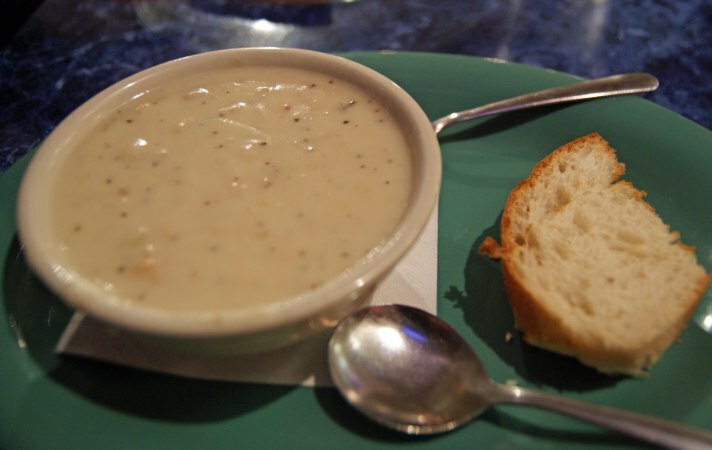 We love a good cup of chowder, and during a trip through New England a few years back, we tried it every place we stopped to see who had the best – no clear-cut winner, but we’re willing to go back someday for another round! The chowder here boasts of no potatoes – I’m not opposed to potatoes in mine, but I can see that clam chowder does have the potential, in some restaurants, to turn into potato soup with a random clam. Not so, here. It was chunky, creamy, and clammy. Clammy in the good sense. 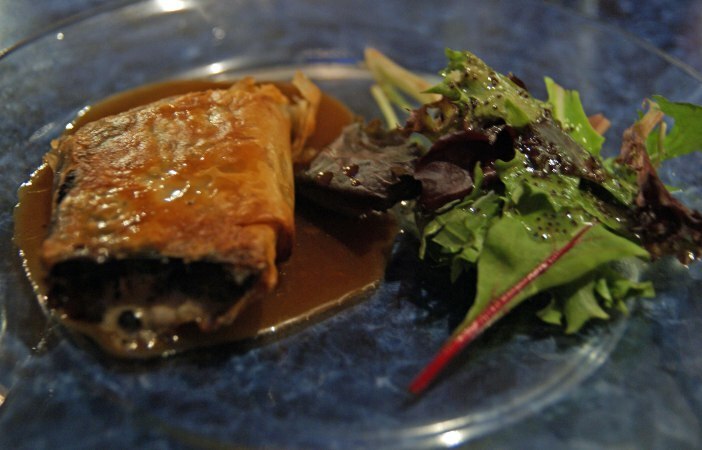 We also tried a portobella strudel, which has the mushrooms braised in red wine, then wrapped in phyllo and baked with cheese. A unique dish, and again, really well done. 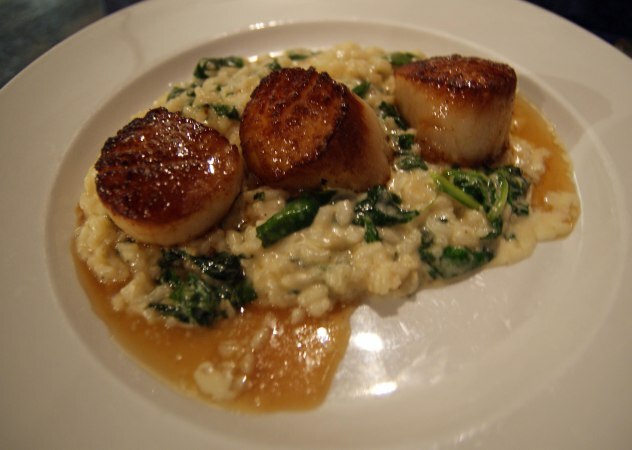 Each of us opted for one of the specials – S had seared scallops over a bed of risotto. Rich and tender with a little crust – perfect. I selected a cod, thermidor-style. Lots of butter, cream, and lobster. 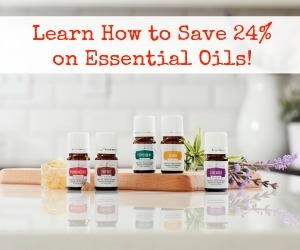 Not the most low-cal option, but oh-so-good. 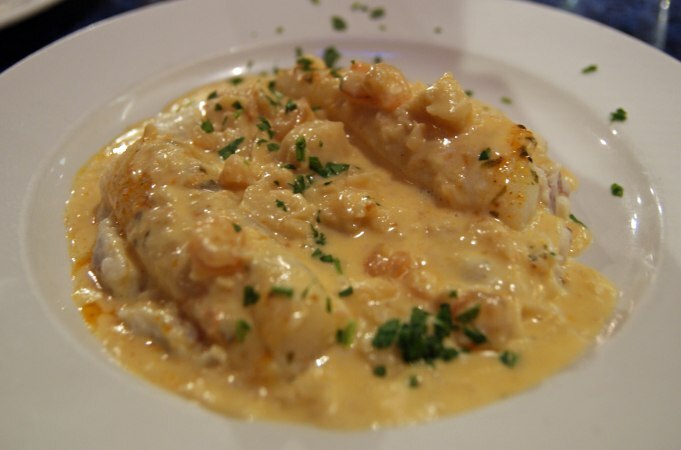 The verdict: Chowder House gets five stars out of seven. The food was all very well done, prices were reasonable, and service was fine. One issue I did have is that our specials were quite a bit more than most of the regular entrees, which we weren’t aware of. Yes, we could (should) have asked, but I tend to assume that they’ll be in line with the usual fare, unless otherwise noted. In the end though, that doesn’t take away from what was a pleasant dining experience.